A Little Honey Yellow 2.5inches x 6inches Gusseted cellophane bags. 100 bags per pkg. Bees and honeycomb nest design. Perfect for self promotion by placing a business card and a small sample/item in them. Use them for party goods and much more. Bag background is clear. This size bag is great for small product samples, business cards, introducing yourself and product and much more. Gusseted - These bags have triangular sides (gusseted) so they will expand to hold more contents. Our cellophane bags are food safe. Comments: I ordered my bags on a Thursday and received them on Saturday. From CA to OH in two days? WOW!!!! Thank you. Oh BTW, I love the bags!!!! Comments: At first I received these bags for a warm chatter challenge that I met. They are perfect for lipstick samples, a business card and a couple pieces of candy. 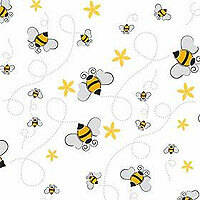 The bee design is perfect for all Mary Kay consultants. Definitely recommend these cute bags! Comments: These will work perfectly for our bee-themed luncheon cookies.